SANTA FE, N.M. – Santa Fe Police are looking for a few good men and women to participate in our Citizen’s Academy. The Academy runs for 12 consecutive weeks in two hour sessions. Participants will learn about each aspect of law enforcement, our training and what it takes to be a Santa Fe Police Officer. The purpose is to develop a relationship between law enforcement and the community through education and create a nucleus of responsible, well-informed citizens who can inform the public while offering any comments and ideas for solutions to problems facing SFPD. Applications are now available for the next academy beginning on September 26, 2013. Sessions are held Thursdays at 6 p.m. and will be held at the main police station located at 2515 Camino Entrada. Areas of training include Internet Crimes, Traffic Investigations, Detective-style work through Criminal Investigations, SWAT Training, and Domestic Violence Training. There is a $45 application fee which will cover meals at every class and a polo shirt embroidered with the Police Citizens Academy logo. To enroll stop by the main station or contact Officer Louis Montoya at (505) 955-2752 or lamontoya@santafenm.gov. This is a wonderful way to learn more about police work and give back to The City Different! The National Volunteer Fire Council (NVFC) has partnered with the EMS attorneys at Page, Wolfberg & Wirth to offer an exclusive free webinar for NVFC members on the impact that recent changes to HIPAA will have on volunteer EMS providers. This webinar would typically cost $149, so take advantage of this free offer! The webinar will take place Thursday, June 27 from 2-3:30 EDT. View flyer or register now. What is the FLAME Act of 2009? This morning, one of my colleagues, Kelli Merritz, tweeted at me, telling me that there was a Senate hearing of the Energy Committee on wildland fire management. You can watch the whole 2-1/4 hrs session here (sadly, I cannot seem to embed it): http://www.energy.senate.gov/public/index.cfm/2013/6/full-committee-hearing-exploring-wildland-fire-management. There was talk, throughout, as to whether the FLAME Act had been properly implemented since it was signed into law and how to make sure that happens. I had no idea what it was, so I went and looked it up…. The main provision is the establishment of two FLAME Funds; one for the Forest Service funded at $413 million and one for the Department of the Interior funded at $61 million in FY2010. These funding levels are not permanent and are likely to change in coming years. The FLAME Act requires the agencies to develop new methods for determining fire suppression funding estimates in the future. Not surprisingly, the FLAME Act acknowledges that the previous method of using the 10-year rolling average has not been effective: “the 10-year rolling average has failed to keep pace with actual funding requirements and has led to significant disruptions as agencies borrow from non-fire programs accounts when funds are exhausted”. One of the main objectives of the policy change was to reduce the transfer of funds to wildfire suppression from other agency programs, a practice which has led to significant disruptions in other non-fire programs. Congress expects the administration to appropriately and fully estimate suppression costs, but not at the expense of other agency programs. The FLAME Act requires the Agencies to report to Congress on a quarterly basis on the use of FLAME funds, a provision designed to avoid last minute emergency actions. The conference report language encourages suppression planning from year to year through a new approach to budgeting for both the FLAME funds and the Wildland Fire Management appropriation. The funds can only be used after a declaration by the Secretary of the Interior or Agriculture that a fire is large or complex or if annual suppression accounts are depleted. I was initially posting this just to share what the FLAME Act is, since this is and will continue to be an ongoing topic of discussion if you’re reading / watching things about wildland fire funding policy. Frankly, though, the entire session is really quite educational and if you can come up with 2 hours to watch it, you absolutely should. On January 25, 2013, the U.S. Department of Health and Human Services (HHS) published a long-awaited Final Rule, implementing sweeping changes to the Health Insurance Portability and Accountability Act (HIPAA). The Final Rule grants patients new rights regarding their health information, modifies the standard for HIPAA breaches, ramps up HIPAA enforcement, and makes a host of other changes that will affect HIPAA-covered EMS agencies. Organizations have untilSeptember 23, 2013, to comply with the changes. 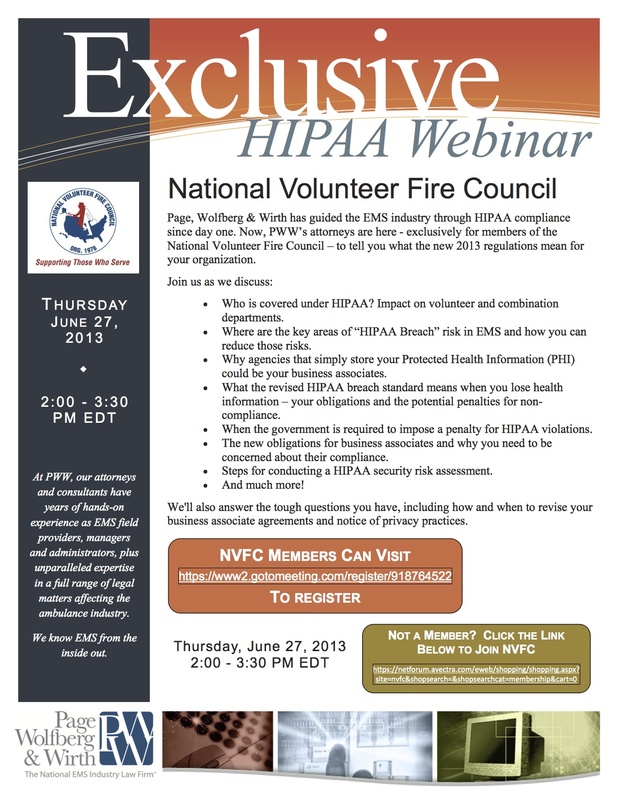 To help the nation’s volunteer and combination department EMS providers better understand these issues and the practical implications of the new HIPAA regulations, the National Volunteer Fire Council (NVFC) and the EMS attorneys at Page, Wolfberg & Wirth (PWW) are hosting an exclusive webinar on June 27 from 2-3:30pm EDT for NVFC members at no cost (a $149 value!). During this webinar, we will tackle the big questions for volunteer agencies and go into detail about how to grant the new patient rights, how to conduct a breach risk assessment, the changes you need to make to your business associate agreements and notice of privacy practices, and much more! PWW has guided EMS agencies nationwide through HIPAA compliance since day one and now our attorneys are here – exclusively for NVFC members – to tell you what the new 2013 regulations mean for your EMS or fire service organization. NVFC members can register for this free webinar by clicking here. If you are not already a member of NVFC but would like to participate in this webinar, click here to join. Click here to learn more about the big questions volunteer organizations are asking, which will be addressed in the webinar. What does society do when one person’s behavior puts the greater community at risk? That’s a no-brainer, right? We make them stop. We pass laws, or impose economic rules, or find other way to discourage individual behaviors that threaten the greater common good. You don’t get to drive drunk. You don’t get to smoke in public places. You don’t even get to leave your house if you catch some particularly infectious disease. Then what should we do about people who decline vaccination for themselves or their children, and put the greater public at risk by fueling the resurgence of nearly eradicated diseases? Isn’t this the same thing, one person’s perception of risk producing behaviors that put others at risk? Of course it is. Isn’t it time for society to say that in the greater public interest, we need to regulate the risk created by the fear of vaccines? Yes. It is. The evidence is overwhelming that declining vaccination rates are contributing to outbreaks of disease. Take just one example, measles. The WHO reports outbreaks in many countries where vaccination rates have gone down: As of June – France (12,699 cases in 2011, more than in all of 2010 already, including six deaths), Spain (2,261), Italy (1,500), Germany (1,193, one death), Switzerland (580), Romania, Belgium, Denmark, and Turkey. There have already been 550 measles cases in England and Wales this year compared with 33 all of last year. The U.S. has seen 156 cases as of mid-June, compared to a total of 56 cases per year from 2001-2008. The CDC has an emergency health advisory out for measles, a disease officially declared eradicated in the United States in 2000. Small numbers, you say? True, but consider their cost (beyond the suffering of the patients). Measles is ferociously infectious, and potentially deadly to the young or old or people with weakened immune systems, so it requires an intense response from the medical and public health communities. Consider just one small outbreak: When a woman from Switzerland who had not been vaccinated for measles visited Tucson and became symptomatic, she went in to a local hospital for medical attention and three months later at least 14 people, including seven kids, had gotten measles. Seven of the victims caught the disease while visiting health care facilities. Four people had to be hospitalized. The outbreak cost two local hospitals a total of nearly $800,000, and the state and local health departments tens of thousands more, to track down the cases, quarantine and treat the sick, and notify the thousands of people who might have been exposed. Fueling the spread? None of the victims had been vaccinated, and, remarkably, 25% of the workers in the health care facilities where the patients were treated had no immunity to measles (either they had not been vaccinated or the antibodies from an earlier vaccination could no longer be detected in their blood stream.) One health care worker got the disease, and gave it to two other people. That’s just one example of the growing threat to public health caused by people worried that vaccines will cause autism and other harms, despite overwhelming evidence to the contrary. In many places, particularly in affluent, liberal, educated communities (Boulder, San Diego), unvaccinated people are catching diseases that vaccines can prevent, like measles, whooping cough, and meningitis. In 2010 as California suffered its worst whooping cough outbreak in more than 60 years (more than 9,000 cases, 10 infant deaths), Marin County, one of the richest and most educated areas in California, had one of the lowest rates of vaccination statewide and the second highest rate of whopping cough. A 2008 study in Michigan found that areas with “exemption clusters” of parents who didn’t vaccinate their kids were three times more likely to have outbreaks of whooping cough than where vaccination rates matched the state average. And this is a risk to far more people than just those who have opted out of vaccination. People are getting sick who have been vaccinated but the vaccine either doesn’t work or has weakened. (Of the 156 measles victims in the U.S. as of June, nearly one in five of them had been vaccinated but the vaccine didn’t work, or had weakened.) Infants too young to be vaccinated are getting sick, and some of them are dying, when exposed to diseases in communities where ‘herd immunity’ has fallen too low to keep the spread of the disease in check. Unvaccinated people are getting sick and visiting doctor’s offices or hospitals seeking treatment, raising the risk to anyone sharing those facilities, costing the health care system millions of dollars in avoidable expense, and costing local and state government (that’s taxpayer money, yours and mine) millions more as they try to chase down each outbreak and bring it under control, to protect the public’s health. Your health, and mine. (A recent economic analysis found that “…vaccination of each U.S. birth cohort with the current childhood immunization schedule prevents approximately 42,000 deaths and 20 million cases of disease, with net savings of nearly $14 billion in direct costs and $69 billion in total societal costs. It is time to act in the face of this threat. This is not to deny the feelings of those who fear vaccines, or denigrate those fears as irrational, as many in the health care and vaccine communities too readily do. In fact, this is to recognize and respect the honest and powerfully deep roots of those fears, and the fact that no amount of communication or dialogue or reasoning can make people really worried about vaccines, stop worrying. Risk perception is ultimately subjective, a combination of the facts and how those facts feel. Sometimes our fears just don’t match the facts, and the gap between our feelings and the evidence, what I call “The Perception Gap”, produces real risks all by itself, risks which need to be managed the same way society tries to manage myriad other threats to public health from which we can’t protect ourselves as individuals. There are many potential solutions, each fraught with pros and cons and details that require study and careful thought and open democratic discussion. — Perhaps there should be higher health care/insurance costs for unvaccinated people. — Or we could do it in a positive way, with reduced health care/insurance costs for people who do get vaccinated, ‘healthy behavior’ discounts paid for by what society saves by avoiding the spread of disease. — There could be restrictions on the community/social facilities unvaccinated people can use, or limits on the social activities in which they can participate, like lengthy school trips for kids, etc. — Here’s an idea; vaccination, including boosters, should be required of anyone who wants to work in health care. This is not about creating more government to intrude further into our lives. There is already too much of that. This is about calling on government to do what it’s there for in the first place, to protect us from the actions of others when we can’t protect ourselves as individuals. We do this in countless ways already. It is appropriate, and urgent, that we act to protect ourselves from those whose choices about vaccines are putting the rest of us at risk, and do the same thing society always does whenever one person’s behavior endangers the greater community. We make them stop. According to a review recently put out by the the Police Executive Research Forum (PERF), the Albuquerque Police Department (APD) was faced with a riddle. In recent years, violent crime and assaults on officers have been declining, training has been adapted to focus more on deescalating conflicts and avoiding physical confrontations, the department procured and trained officers on less-lethal weaponry, a non-disciplinary Early Warning System was put in place to identify officers with warning signs of excessive use of force based on recent incidents, and a Crisis Intervention Team created to help deal with mentally ill persons, which are present in 65% of officer-involved shootings nationwide. Still, Albuquerque’s rate of police-suspect encounters involving use of force remained unusually high relative to comparable cities. Eager to find out what was going wrong, APD collected all the data they could. Already, any police use of force, from grabbing a suspect to a fatal gun battle, was reported and reviewed by numerous committees through the police hierarchy, Internal Affairs Division, and civilian government. As anyone involved with law enforcement will tell you, reporting and record-keeping is extensive. On top of that, APD monitored their officers with audio recorders on the gunbelts and video recorders on the shirts of every patrol officer, as well as dashboard cameras on squad cars involved in higher-risk operations. They even instituted a database that signalled when an officer was involved in activities indicating risk too often. APD pored over this information to revise training and procedure to little avail, as use of force rates remained steady. The Albuquerque Police Department is not the only one confused over use of force. Nationwide, experts agree that despite extensive writing on the subject and software to track incidents, use of force, and especially wrongful use of force, is poorly understood due to gaps in data and inconsistencies in reporting between departments. There are many “snapshots” of use of force from select departments, studies, and reports, some contradictory, but no big picture. Even Albuquerque, where the police department is in line with the most progressive practices on monitoring violence, suffers from data gaps and faulty reporting procedures, causing PERF to recommend better checking and reporting of use of force, documenting the response and outcomes of the Crisis Intervention Team, more follow-up reports on responses and outcomes, and more integration of the various monitoring and reporting mechanisms in place. One way to achieve these goals is to bring all the data on police use of force together, rather than just storing a count of incidents in a database. Ideally, a use of force database would include data from police departments across the country, like the FBI’s national finger print database IAFIS or its Combined DNA Indexing System CODIS, which would allow towns, cities, counties, and states to learn from each other, share best practices, and improve reporting and monitoring nationwide. Even for one city like Albuquerque, however, this would be a Big Data challenge. Consider all the information that can be pooled to provide a more complete view of use of force incidents. On top of a description the the actual incident, it would be beneficial to have dispatcher data to see what the officer knew going in and how he or she was dispatched. Of course, the police report would be included, as well as any other reports and findings around the use of force, which for a shooting, fatal or not, would include the findings of a Multi-Jurisdictional Investigative team, a Homicide Unit investigation, an Internal Affairs Investigation, interviews with psychologists, and reviews by the Grand Jury and the city’s Independent Review Officer. In an effort to see the citizen’s and suspect’s perspective, complaints would be included in the database, as well as any relevant newspaper articles. To get a better understanding of the officers, their records, commendations, citations, and training would be included. Aside from this mass of text, a whole host of audio-visual recordings would be used to objectively chronicle the incident, including the audio from the officer’s gun belt, the video from his or her uniform, and any relevant footage from a dash-cam or video surveillance camera in the area. Storing and analyzing this information would be no small feat. The data is complex and unstructured, stored in different formats from text to indexed reports to audio and video. If other police departments were to be included, even more formats would arise. The data is also massive. To give an idea of the scale, APD alone produces about 9,000 police reports a year for 45,000 calls for service and makes about 1,200 felony arrests. Nationwide, fewer than 2% of interactions result in use of force, but assuming 2% for the 45,000 calls for service results in 900 use of force incidents every year. Though daunting, this would be a challenge worth taking. In fields from business to medicine and intelligence, better and more holistic data, when analyzed, has revealed conclusions contrary to anecdotal evidence and practitioner impressions. Even in law enforcement, extensive data analysis on old problems has yielded shocking results, such as correlations between moon phase and crime, later attributed to how bright it was at night. Bringing together traditional reports with evaluations and reviews can add depth and significance, including more non-police observations and commentary adds perspective, and audio and video provide a means of verifying and the information. Storing and analyzing this Big Data cheaply and effectively is not impossible thanks to advances in data science driven by business intelligence. Apache Hadoop, for example, can store and process massive amounts of unstructured data in its original form for pennies on the dollar as it is open source, requiring no licensing fees, and runs on clusters of commodity hardware instead of supercomputers. It also provides a platform for complex and evolving analysis with a variety of open source software. This analysis can then automatically sift through the terabytes to petabytes of data to find trends and warning signs with much more depth than the current system that only looks at counts of certain incidents. Department-wide trends can be generated and when an instance or officer is being reviewed, relevant data can be pulled from the system. Already, a host of analytics exist to help with text, audio, and video analysis, some designed specifically for Hadoop. IBM‘s Watson, for example, used textual analysis to defeat human contestants on Jeapordy!, generating questions for the answers on written on the game board in real time by pouring through a virtual library. Other software can analyze audio recordings for emotional state and signs of aggression, and Video Content Analysis can flag suspected use of force and erratic or suspicious behavior. Products like piXserve can automatically index and search video. Machine learning tools like Mahout, developed to work with Hadoop, can pick up trends that analysts weren’t even examining. And capabilities like the full stack of Hadoop-related components in the Cloudera Distribution including Apache Hadoop (CDH) make the entire stack one of high-performing, high-availability capabilities that deliver on both analytical and management tools. All together, a Big Data analysis approach to police records would mean more than decreasing gaps and checking accounts. Even the PERF report, which combined interviews with extensive statistical analysis, wasn’t able to pinpoint where the problem was for Albuquerque, instead suggesting 40 small changes that may together lead to possitive trends. Most are slight improvements to procedure, some as minor as proposed name changes. Overall, APD seemed to have done everything right, leaving even the experts with what the intelligence community after 9/11 termed a “failure of imagination.” When done well, however, data analysis can find trends that analysts could never imagine and search for. For example, there may be a telling correlation between an officer’s geographic location, the aggression in his or her voice, the and the outcome of the interaction. As a result, the use of Big Data storage and analysis tools like Apache Hadoop can revolutionize not only police record keeping, but, through the findings, the practice of policing itself.